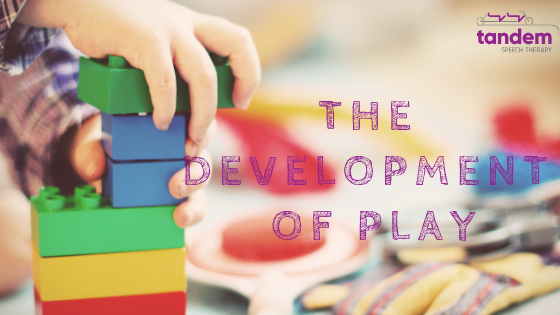 To kick of blogging this year (2019), I figured a primer on the development of play was in order. How does play develop and evolve as kids get older? What does play look like at these different stages? Play is much more than fun for our children. Play is how they learn about the world around them and interact with it. During play, children learn to problem-solve, form relationships, develop their social skills, learn and use language, and build executive functioning skills. An opportunity to play and explore is crucial for a child’s development! The development of play skills effects language development, pragmatics, and cognition. It’s also much more complex than we can imagine. 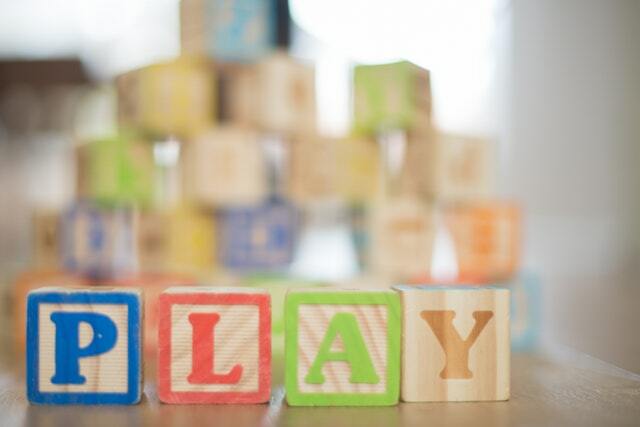 Did you know there are three distinct types of play and five social stages of play exhibited in children between birth and age five?! Functional play begins before age 2 and continues through the later stages of play that you’ll learn about below. It is the predominant type of play we see in infants and toddlers. Functional play is often a combination of sensory-related and motor play. This will look like your baby mouthing objects or exploring toys with texture. Functional play is also a toddler climbing on objects and your older child riding a bike. Symbolic play gets broken down into 2 subcategories–constructional play and dramatic play. Constructional play begins around 2 years old and can last in various forms through adulthood. It’s when we use materials to make other objects such as building a tower with blocks or using playdough to make a cat. Dramatic play is mastered between ages three and five years. It is when a child creates a pretend play scenario and pretends to be someone else. Dramatic play is when your child takes off his shoe, puts it up to his ear and says ‘hello’ as if it was a telephone or when you pre-kindergartener plays teacher/school with her friends. Game play develops in school-age children and beyond. When children play games with rules, use logic, and appropriate social skills to navigate in their interactions, this is game play. Game play can be accomplished with board games, card games, and seen when a child plays soccer with their friends. Solitary play is when children start to play on their own. They do not seem to notice other children sitting or playing nearby. This stage of play typically occurs before the age of 2 years. Solitary play is your 18-month-old sitting on the floor with their stacking ring toy or a three-year-old playing with blocks by herself. Onlooker play is when children watch others play. They may ask questions, but the child does not make an effort to join the play routines or does not know how to play. Onlooker play does not have a specific age of development. You may have seen onlooker play in a preschool classroom. It would be when two children are playing in the water table while a 3rd child is standing by to watch them. Parallel Play is when children begin to play side-by-side with other children without any interaction. They are paying attention to each other and often engaged in the same activity. Parallel play develops at 2-3 years old. It can be seen when two children are playing with their own farm animals, both making animal sounds, but not looking at or interacting with each other. Associative play is when children are interested in the people playing but not in coordinating or organizing the activity together. There are interactions and children may ask questions of each other, but they are not playing with each other. Associative play develops at 3 1/2 to 4 1/2 years of age. The children will be playing with the same materials, such as an easel while sharing markers, but making separate pictures. Cooperative play is when children begin to share ideas and toys and follow established rules and guidelines. They are interested in both the people playing and the activity they are doing. Cooperative play emerges in children at ages 4-5 years old. Cooperative play can go hand-in-hand with dramatic or pretend play. It is when we see two kids playing with baby dolls–one is pretending to be the mom, and the other is playing the role of the dad. Now we know what the development of play can look like as our children grow. But how do we help kids increase or improve their speech and language during play? Check out my series, Playing With Purpose, for all my tips and tricks. 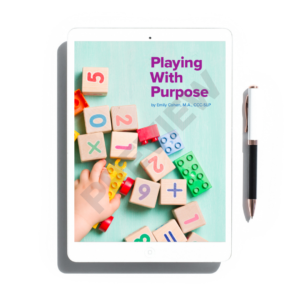 Want to learn more about Playing With Purpose? Parten, M. B. (1932). “Social Participation among Preschool Children”. Journal of Abnormal and Social Psychology. 27 (3): 243–269. 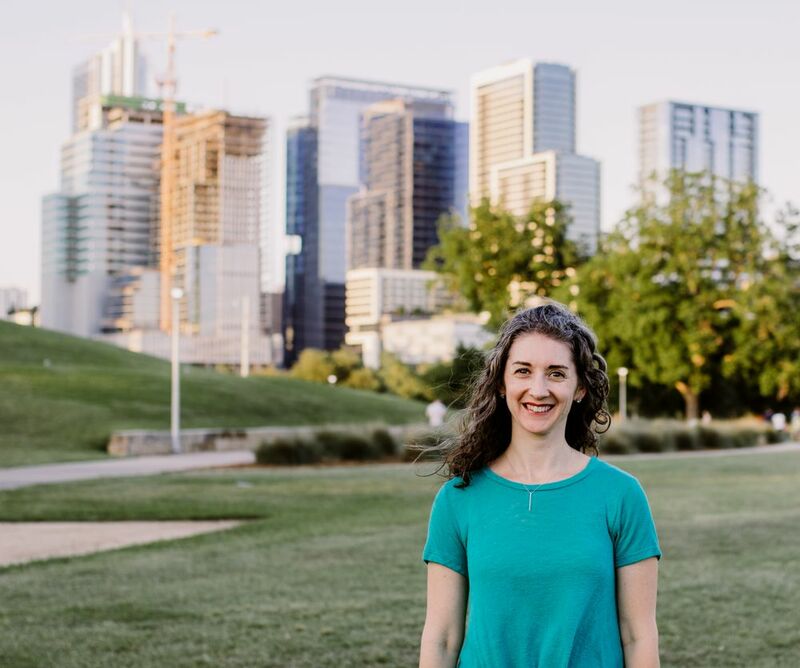 Learn how to purposefully and intentionally interact with your child during play and help them increase opportunities for speech and language development!